My hands are shaking and my knuckles hurt. I look down and my stomach drops. I remember that birthday party at the rock-climbing place I ran home from after climbing ten feet up the wall. This is a little higher. Hundreds of feet below is only rock and water. My grip tightens, I rechalk my left hand, spot my next hold, and leap. In reality, I’m standing in a hotel room. Some of the lead developers are watching me, a grown man sporting an expensive black obelisk on his head standing in front of a computer while his knees buckle and he curses on cue. I’m playing The Climb, a new Oculus VR project from Crytek. They’re a developer renowned for chunky, beautiful action experiences like Crysis or Ryse: Son of Rome, but in The Climb there are no guns, no alien threat, no armored hunks yelling about war—it’s just your hands, gravity, and a vertically efficient mountain. I controlled two eerily disembodied hands—imagine Thing’s leisure time—by looking around with the Oculus and grabbing notches in the rock face with the left and right triggers of an Xbox controller. Craning my neck around to position my hands was somewhat awkward at first, but as with most VR games, after a few minutes of acclimation, I was scurrying up the cliffside like a (scared) man goat. Even though I adapted to the control scheme, I couldn’t help but wonder why The Climb wasn’t demoed with Oculus Touch, though I was assured it will definitely support the technology. Either way, in order to clamber (or crawl, mostly) up the cliffsides, I had to find proper routes by leaning forward, standing tall, or crouching down in order to get my creepy hands within reach of a handhold. No one had to tell me to do this; it was a natural instinct, made especially eerie by my natural inclination to reach around the rock if it curved, or lean back if it began to slant outward. While I took the simplest route I could, during my ascent I saw dozens of alternate routes, some perhaps more efficient, albeit riskier. Only one or two particular gaps required me to ‘jump’ (performed with a button press and a well timed grip) between them, but it’s implied that I’d be able to subvert huge sections of my climb via risky leaps and maneuvers. I’m not that brave. My ascent was slow and careful—I didn’t fall once. The thought was too scary, a nod to the holiest of VR buzzwords, ‘presence’. The screenshots are pretty, but they just give me vertigo now. With each new hold, chalk meters on the backs of my hands would drain. Run out completely, and I would lose my grip and fall. It’s a strange mechanic, one I don’t quite understand the purpose of yet, though it might become clear in extended play. I didn’t mind too much though, rechalking my hands gave me a good opportunity to soak in the detailed vistas. In this particular demo, I played in a loose approximation of Southeast Asia. The remaining levels will all be based on real world locations, just not exact replications of actual climbing features. The environments remain the only obvious sign of Crytek’s signature, rendered in gorgeous detail and running at a steady clip. I didn’t notice any frame drops, and VR is best if it maintains 90 frames per second—too low and it can make you sick. I don’t know what kind of rig was running the demo, but it’s obvious that CryENGINE has benefited from the strict requirements of VR optimization. My brief time with The Climb was a harrowing bit of fun, and apparently I only played easy mode. When I prodded for more information about how the difficulty would be expressed in later levels, I couldn’t get a concrete answer. I’m told we can expect plenty of dynamic events, but otherwise I’m left to speculate—crumbling rocks, collapsing beams, and plenty of massive crevasses, I imagine. Time trial modes will add another layer of urgency for those looking for some competition. Started from the bottom, now I'm here. The Climb is positioned to be an accessible game, one that extends beyond the typical gaming audience, and mechanically it totally is, but I teetered on the edge of panic as often as I teetered on the edge a sheer cliff. It's meant to kick in an adrenal response, and I'm not sure emulating near death experiences will be something my mom can get super into. My dad, maybe, but only after pounding a few Hamms tallboys. This isn’t to say The Climb won’t appeal to a new audience, it’s just that VR’s mass appeal is still a big, bold question mark. All said, I love the idea of a media barrage similar to the Wii Sports phenomenon, an infinite supply of local news montages where elderly folks find new life as VR adrenaline junkies instead of chronic cathode ray bowlers. I'm super scared of heights. For those with a similar inclination, The Climb could be a fun, therapeutic method for working through the fear. For adrenaline junkies, it might be a weak approximation of the real thing. 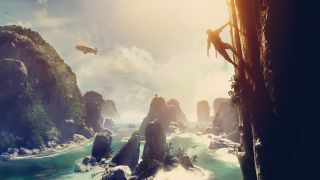 Either way, The Climb is a nice change of pace for Crytek, an otherwise simplistic game made thrilling thanks to VR. The Climb is set to arrive during the Oculus Rift launch window in 2016.